I know it’s been over two weeks since I attended, but Barcamp Omaha totally deserves a post. I enjoyed this “un-conference” so much more this year than I did last year, and it was mostly because I changed my own expectations of the event. More on that in a mo. Barcamp is a place to evaluate and supplement YOUR goals, not compare yourself to the realized goals of others. When I went to Barcamp last year, I left feeling fairly deflated. I definitely had a good time during the day, but by the time it was over I couldn’t shake the feeling that I was trapped in work-related quicksand. Everyone there appeared cooler and more successful than me. It seemed like every other attendee had their entire days to dedicate to their small businesses, and I was the only one who was trying to squeeze things in between diaper changes. Obviously this was ridiculous, because Erin was my Barcamp buddy last year, and she, in fact, was doing exactly that. This year was different. I attended with the memory of my feelings last year, and that was helpful. I’m also a year older, so maybe I actually learned a little bit about comparison? Probably not, but who knows. It was a little bit more obvious to me, this time around, that everyone there had something they were trying to achieve, AND that each person probably knew something that would be helpful to me. Basically, if you go in to one of these conferences thinking everyone is too cool for school, it’s totally going to feel that way. If you go in thinking that everyone knows something valuable, and that you need to learn from them, you’ll have a much better experience. Granted, there are going to be some people who are too cool for school… but that’s life, right? If you’ve got the opportunity to present something, doooooooooo it. Barcamp is an “un-conference.” That means that the attendees are the presenters, and you sign up the morning of the conference to speak. There are usually a few open slots throughout the day, but they almost always get filled up. Presenting was terrifying and awesome. Erin and I both initially walked around feeling a bit like puking, and I’m glad that we signed up for a morning slot so that we didn’t stress about it all day long. After the presentation was over, though, I felt a little bit like a superhero. I hadn’t been in front of people like that in a long time, and I rode that adrenaline alllllll day. 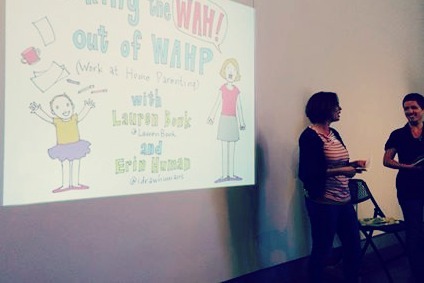 Our presentation was about working from home with children, which is something we’re both very, very familiar with. Erin drew up some incredibly awesome slides to accompany the presentation, and you can see them (along with her recap) here. That’s the beauty of Barcamp: you are qualified to talk about something. You may not feel like it, but you are. Erin and I have been working from home around our kids for at least four years each, now. That means we have both successes and failures to share… and plenty of people can benefit from them. Are you good at keeping pet snails alive? Come to Barcamp next year and talk about it. Are you an expert at meal-planning? Please, come to Barcamp next year and talk about it. Are you incredibly good at pairing wine with chocolate? You should definitely come to Barcamp next year and talk about it. Someone is going to learn a lot from you, whether you’re a tech expert or a professional basket-weaver. It’s okay to sit on your business for a while. One of my favorite talks was a fantastic panel presentation called “The Leap.” Five local business owners talked about taking “the leap” into officially opening their businesses, and a woman named Sharon from Buds and Buttons said something that really resonated with me. Someone had asked her if it was scary to officially open her business, and her response was “No.” I’m removing the quotation marks now, because I’m totally paraphrasing here, but it wasn’t scary to her because she had spent the last eight (I think?) years running her business from her basement. She was more than ready to open up because the foundation for her floral business was already forged and was ready to meet the world. This hit home big time for me. I need to change my attitude. I love Omaha. I love Omaha. The fact that opportunities like Barcamp and Wordcamp are available is something I am so thankful for. Nurturing my business has not been easy with my lifestyle, but Omaha… with the cultural, technological, and social opportunities it provides… has been an irreplaceable resource in itself. I know that I have friends and family members in Nebraska with small businesses, and I want to take this moment to urge and beg you to fit this into your schedules next year, regardless of where you live. Whether you present or just watch, I know you’ll leave with helpful knowledge you didn’t have when you left the house that day. When the date for next year’s is announced, I’ll make sure I announce it, too. If you come, we can totally sit next to each other and high-five at multiple times throughout the day, I promise. OR I can promise NOT to high-five you… if you’re not into that kind of thing.